Back to work after the run on Sunday! I believe many of you has also made this race a "fly in, run, fly out"affair. Myself and wifey flew to Kota Kinabalu via the usual budget airline. And for the perhaps, 10th time, yes, i am complaining again that they delayed my flights. Many has said that if you fly "Air Asia, expect delay". But why should we as paying passengers? the KUL-BKI (Kuala Lumpur - Kota Kinabalu) sector is by far one of the busiest with up to six flights a day. It just does not justify. No one's time is as important as the next one. Nevertheless, after a total of 2hours and 30 minutes delay with two rescheduling, we were safely in the flight. By KL, for a night. Don't miss us. I must thanks Doc Azman for being the kindest soul to pick me and wifey up from the KK Airport and drop us in Borneo Backpackers. We could had taken a taxi, but we could not resist the offer since we need to pick up our race kit from him as well. That is double thanks for the race kit pick up too! Thanks Doc! The arrangement to stay in Borneo Backpackers were a suggestion from Tey. A group of the usual runners stayed at Borneo Backpackers last year during the Kinabalu Climbathon and only had good things to say about it. Since we will only be there for a night, why not? After all, we just need a clean place to rest the body before and after the race. I will write about Borneo Backpackers in my blog by next week. So, if you are a budget traveller to Kota Kinabalu and do not want to spend more than RM70 for a room with aircond, wait up for the write up. Don't be fooled by the woman at the door. She is a maneater. We had a quick dinner at the usual place when I am in Kota Kinabalu - the best place that serve an almost authentic mee goreng tuaran with seafood. You can't say no to this simple dish filled with vegetables, fresh large prawns, fish fillets and generous squids in homemade noodle that is fried and topped with clear egg broth. At RM7.50, it is on the high side even for KL, but standard of living in Kota Kinabalu ain't that low either. This is a "must have". The shop that serves this is non-halal though. My untouched photo is a "pale" comparison of the actual serving. Should i make it more "delectable" using some post processing? OK. The only reason for posting the above up twice was because at this point of writing, i am hungry. Back to the race report. As we only managed to settle ourselves down at about 9pm that night, a quick preparation for the race kit must be done. With some years of racing, i know better that if anything were to be forgotten before the race, it will be the items that will be crucial for the race - and pretty much potential to make a good race to a bad race. Don't take the preparation one day before the race for granted (and that include your toilet schedule). Stupe Must Have: Shoe, socks, running number, pouch for real food, camera (using it to take photo lah), spare camera batteries, iPhone, money, IC, cap, watch, HR strap, bottle of water/electrolytes and of course, sunglasses. We lights-off at about 10pm, way too early by our standard. But imagining the kids is with us and we are putting them to sleep, i believe we soon dozed off with alarm being set at 12:50, 1:00, 1:10 and 1:20. Call it paranoia, but I have on two occasion woke up late resulting in me almost missing my flight and missed my flight. It was definitely not a sleep deep snooze but good enough for some eyes shut. I woke up at about 12am and saw that it was raining. Oh my. Will it be a wet marathon? Taxi (pre-arranged) will come pick myself and wifey up at about 1:45am (which he came at 1.30am). 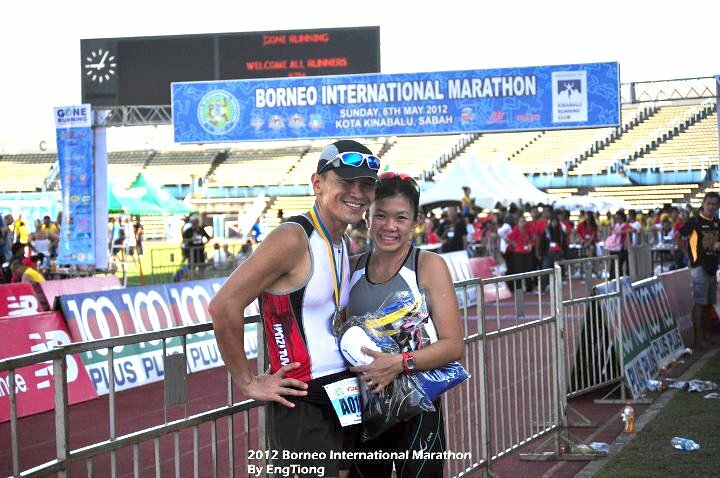 We missed the opportunity to sign up for the transport by the Borneo Marathon organisers and will have to pay for taxi. Wet Sunday. Which meant, a clear sky later. Hot day expected. Run fast. I went back to bed and woke up at about 1am, quickly gobbled down some of the prepared food made by wifey (the homemade bread and the homemade granola bars), kitted up and we were ready to go. It was still drizzling slightly and the air was dense with fresh air. Granola and bread. Made with Love. Likas Stadium is situated about 5km away from Borneo Backpackers and the option to walk there did cross the mind. The journey there took less than 10minutes and we reached the Stadium at 1.45am. It was almost empty except for the organisers and a few runners. If only there was a bed. Another hour of sleep would be good. It was empty, if not because of the flood light, i would had thought we were at the wrong location. Runners started trickling in at about 2.15am, and the place started to come alive with some music playing. What was disturbing from the time we reach till 2.15am was that there were no indication of any timing devices. I assured wifey that maybe they have not put it up yet. I was getting curious myself and the only timing device at the race site was the giant clock on the scoreboard. Here. No digital timing too! Anyhow, it is not the most important thing as seasoned runner would not rely on external timing except their own watch. It is an extension to the runner and more so, it will allow for personal time tracking and progress. The numbers of marathoners did not exceed 400 i believe. It was a small number of runners which make Borneo Marathon different from the other locally organised races. Or perhaps, the people in Kota Kinabalu has not embraced this world class run right behind their home. Maybe the entrance fee is too high too for locals? But one thing for sure, they did the right thing by limiting the prize money and true enough, the absence of foreign "mercenaries" runners from the African Continents were sorely missing. More chances for locals! Bersih T-shirt! And as it is a coincidence that the official running vest is also..Yellow? The race started 3 minutes before 3am. I guessed the organisers realised that whoever that wanted/registered would had been there by then. The compulsory starting photo with wifey and we were off! "okok, so the button you press is to see my pace, distance and time, right? "asked wifey before i snapped this pic. The run brought us from Stadium Likas towards the city centre, passing by the market and towards the airport at Tanjung Aru. Apparently, i was told by Tey that the run was reverse of last year where they ran towards UMS first, before running through Tg. Aru. I believe the decision to change the run direction was more for traffic control. The organisers could had received complains from the locals last year when the run clogged up the traffic towards the airport and also stopped the daily activities on Sunday morning at the wet market. So, reversing the route could offer some respite to the traffic condition at the expense of a more scenic route, and, according to Dannie (Chong), the opportunity to drink fresh coconut water like he did last year! He brought RM50 along for that! For now, lets jus be happy with 100plus ok? By the way, do you know that 100Plus (name) is a creation of one Mr. Mah? He is wifey's friend's dad. He say when you drink 100Plus, you will give your 100 Plus Percentile in the sports you do! Aptly so Sir! Before i forget, let me record gratitude to the volunteers that did not sleep that morning too, preparing water station as early as 3am - i meant, if i am freshly back from clubbing, i would had stopped for some drinks to get sober while watching sweaty body run. Reminder of the Keamatan or Hari Gawai or Harvest Festival happening end of this month. Special shout out to friends that celebrates it either for cultural or for the rice wine reasons. You know who you are! The organisers has placed SYT (Sweet Young Things) at strategic places to cheer the runners. Their chirpiness at 3am would had made some people think that Gawai came early. Not forgetting Police volunteers on Mountain Bikes that roamed the streets for this race. That was awesome. No motorbike was used and two-wheels of the pedalling kind was used throughout the race by marshals! Go! Go! Go! err..maám, why you running at 3am? Because KL people boring. Come KK run more fun! Along the way, i bumped into more familiar faces and Super-Kam was blazing the first 10km...sub 60mins for first 10 is fast! Would had been sub 50mins if i did not stop for him to take photos. By 5.30am or circa KM20, the sun started to rise from the (back) of the horizon. You see, KK is facing west and if my geography knowledge i still fresh, the sun rises from East. Nice or not? I stopped for 2minutes to take this shot...out of 10, only one came out perfect, or almost. At KM20, wifey got her second wind and as i always say in the last two marathons - "i see you at the finish line". So, from there onwards the race become pretty monotonous for me, as the muse went ahead in her quest for a good run. Long, lonely, road...i feel asleep before this photo was taken. It was a momentarily while running - like how some of us doze off while driving. Photo taking resume so i stay awake. The iconic building in Kota Kinabalu, the Yayasan Sabah building. If you look closely, a fisherman in a boat was catching fishes at the river mouth of Sg. Likas. After passing the roundabout at Yayasan Sabah, the 21km runners and the 42km runners mixes up. You see the photo below with Yim on his way back the final 7km the numbers of people at 1Borneo Mall! This is the single biggest run supporter. How many runner has fan club? Along the way, with the sun shining onto my face, i saw Bacin. He was doing 21km..at the speed he was running, he was going for a sub 2:00 run. And you know when Jaja is right behind Bacin, they are doing a 5:00 pace..minimum! Jaja. Mother of Pipi. Wife of Chief Kutu. Triathelete. Smoke you anything. The least expected person that i bumped into was my college mate in RMC. Julian Chong. It as been almost 19 years since i saw him. He still looked good (well, i said it not in a Gay way ok, even if it was, it's Bromance). I snip you off brah! Then, i start bumping into marathoners and i know my U-turn is near. The stretch from the roundabout to UMS was super boring - lucky for some entertainment in forms of friends hi-fiving. Running Couple Dannie and Carrie. He won't let Carrie out of his sight. Sweet. Benchmark. Then as expected...the lady that smoke her man. Here is a tip for the lonelylonesomebored runner - make the line your best friend. A tip i picked up from Zairin. Pretend if i step out of the line, i fall 100feet into oblivion. Did it work? Well...not as good as visiting the locals at their fruit shop. Sadly, no coconut water. So how? Say thank you to the volunteers :) A little thanks goes a long way! Yu wanna come up to ambulance? I snip snip you? Further down the road, i ran past a guy that suddenly shouted my name. "i recognise those tattoo on the calf, you can't run away from me! ", Dr. Azman said! Well said Sir! And it was a pleasure to bump into you! Weather getting hot and it gets a bit tougher. Noticed his bottles were devoid of water and i offered mine to him. Mine was full - of ice. :D Yummy! I left Azman with about 6km to go. Told him to keep it up and take more water whenever possible. Little things like ice on a hot day perks anyone up. As i ran towards the final 5 or 6km mark, i noticed a runner on the road. Must be cramps. 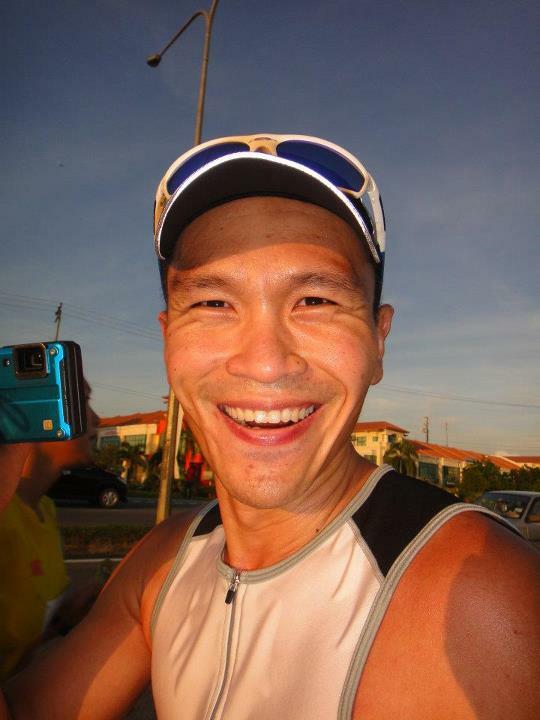 Found out he is one of Choi CC's gang from LYN runner group. Must be tough to be cramped on a clear blue sky Sunday that is starting to get hot. Medic on wheels. I bet if the medic was a woman in bikini, i also will cramp. I offered some ice water (which he finished, GOOD!) and advised that it is best to keep moving. Cramps will get worse if you rest as the body starts to cool down. Hope he was ok! How many noticed the family having a picnic? I waved at them and was invited...should had stopped! 2km more...but my watch says i clocked 41km already...uh-oh...over distance race...or the GPS satellite needs recalibration? What was greatly missing from the race was distance markers. I only spotted a few. I believe many more were looking for it. But so what if the run was over distance? I came to run 42km and an extra 1km won't do any harm. :) Treat as warm down lah! Seriously, if not because of the Peroduas, i would had think i was in California - not that i went there before, but got TV series to see mah! The last 2km was tough. Long road and mentally you just want to get over it. But soon, the Stadium come into sight and it was never more rewarding. Looking at the watch, hey, sub 6:00! I crossed the line with Kam waiting and Yim asking why i left wifey behind. If only he know i kena smoke, again. The Milo van queue wasn't long, so i decided to line up for this treat. Truth to be told, it has too much processed stuff in them - creamer, condensed milk, evaporated milk, sugar...ok. I know, i am boring. Once a while ok or not? 1. Good organisation by the organisers that also include subsidized transport to and fro Likas Stadium. 2. Electrolytes at every station and none were short of water! 5. Finisher T that is of Asian size! A "S" is a "S"!!! 6. Great hospitality by the people of Sabah! 1. While the first Pro is about the transportation, the organiser too should consider giving option for people like myself that did not know of the subsidized transportation. A "pay as you come" system should be considered. 2. Missing distance markers. Important for many as it will help the runner judge their distance covered and a moral booster towards the end. 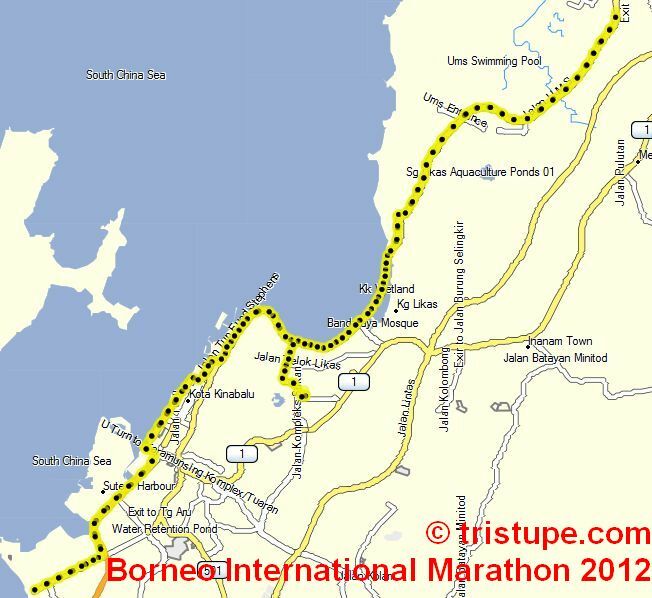 For some of you stats-nerds/geeks, the marathon brought us from Likas Stadium towards Tanjung Aru and back (20km) and subsequently towards UMS and beyond, passing 1Borneo. Why would anyone wants to suffer? So for those of you wondering, yes, the run was over distance. Estimated was about 1km and the GPS sort of confirmed it. Between the recorded 42.94km minus (a very petty) 42.195km, that is a whole load of 745m(!!!). If you look at my stats, i completed my 12th Marathon in 5:44:44. Technically speaking, this is my Personal Best (as my fastest ever was 5:55). If you also noticed it, i actually moved for 5:13:51, meaning there was a whole 30minutes that i spent not doing anything aka stationery! How did that happened? Oh wait...it was the photos taking. LOL. My heart rate was at a low 135bpm average with max of 150bpm. I hardly pushed and it showed in the record. I burned only 2000-odd kcal compared to Bali's 4000-odd kcal. I worked twice as hard in Bali! Wifey did a 5:25:44 on her chip time and if i want to make her happy, i believe she did another PB if taking a 42.195km distance as it is. 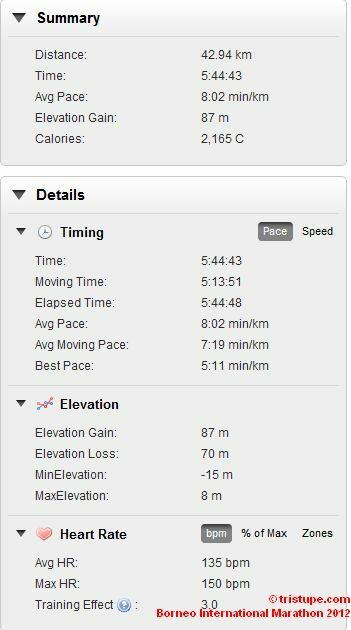 She should had shaved off a good 5 minutes assuming her average pace is 7:30min/km (to cover the 745m extra). But like i said, what is another KM or two if you already ran 42km? :) Good job nevertheless to all! Fantastic pic from Tey! Kamsia! By the way, if some of you that ran noticed, there is a man that ran the whole 42km blowing his whistle and he was also the 5hours 30mins pacer. What this really meant is if you want to do a 5:30 marathon, you follow him. He is none other than Mohan Marathon. ...THIS! See, so happy we all run Marathon! More should join us! With two marathons done in 21 days, the last league to complete the 3 marathons in 64 days would be at SCKLM. Having said that, the Lim's (as in the family) will be interviewed by Sin Chew and TV2 this weekend. We are humbled by the request for the interview! Till then, keep moving forward (i been using this phrase often, which coincidentally, was told to me by my dearest buddy, Shazly Khan when we were heavily training for our Ironman races). I learned one extra thing from your post, I didnt know garmin shows moving time until i saw ur post. :P budak sesaT! I was running too fast on the first half. Pancit on the second half.... hahaha. reading this is very inspirational! I only did 10km but will return for 21km and subsequently 42km in the years to come! Yim - being behind Aileen is a norm for me now...I am happy she ran faster! Kam - it was still a good run! You were fast on the first 20! TTDrinker - You did well bro! Thanks for dropping by the blog. Don't wait for next year to do a 21km and subsequent year for 42km. Prepare for the longest run and do it like it is training. It worked for me! Really impressed with the low HR readings bro! Izhar - you also can bro! Cath - superb being able to finish, that is most important! great pb run. Will go for BIM next year, as your race report shows its quite enjoyable! Btw, mohan's pic of you is superb, good and sharp. Cant hardly believe he took it while running. Bro Wan - i think i was bouncing in-sync with his camera...and being RIGHT at the camera made it possible. he is using SONY. :) How is that for advertisment? BIM is enjoyable as the crowd is good and the organisers are superb. Plus lodging and food in Sabah is easier without being overly priced. I say it is a must-go : PB opportunity!